System O are your ground level team work drills and techniques. This system is meant to teach you your first steps in working together as a team or unit. These are the concepts that can be applied to almost all other aspects of team movement and fire. You should not skip over this skill set, it is very perishable since it relies on more than just you or a single person to accomplish the goal. The more practice as a unit you have the easier these drills and techniques will become allowing you to compound off of them. You will be able to add many more layers to this with a solid base of the fundamentals to rely on as a team. 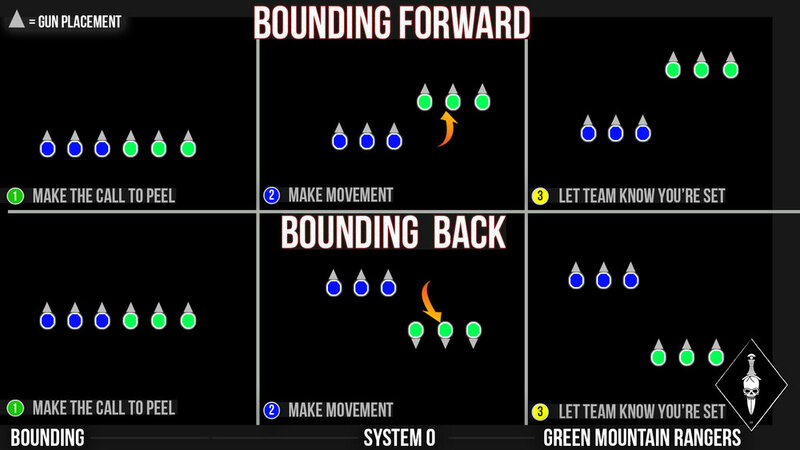 This is our teams preferred method of forward progression. It allows you to have 3 Areas of fire where you may normally have only 1. It allows for a diffusion of responsibility within the team and more protection for the point man when traveling. More eyes to spot potential danger and more guns to react to the contact that is visualized. This is a more of a hybrid formation that transitions from CQB to woodland without alteration. This is the more cautious forward progression, used mostly when contact is expected or immediately after contact is taken. It can also be used to move up hills when more areas of fire are needed. This is our base of fire position and is used a lot during bounding, one our more aggressive formations. This is meant to move the team quickest with the lowest signature. This is used a lot on narrow paths or visually compromising areas. It helps to reduce the time for detection by enemy. The point man has 2 flanking teammates evenly spaced to his right and left covering has side angles. This team is acting as one and their spacing and positioning is variable depending on the terrain and situation. The 3 men are acting as 1, similar to a blocker each knowing their part and fluidly playing off of each others positioning and confidence knowing your teammate is allowing you to focus on your sector of fire. This can be looked at as a Ranger file with a double blocker in the front of the stack. On line is when the whole team is parallel to each other moving in a forward direction with uniform spacing and pace of movement. This is to provide a wider and heavier base of fire to allow the whole team to move freely as one. Ranger file is a standard follow the leader, one man behind the next. This movement is for fast maneuvering of the team for better position. This is not used for traveling through or into contact. This is a horizontal shift of one fire team to gain a superior position on the situation. This is utilized when taking contact and trying to flank or escape from the enemies fire. It is done as a team movement to keep the returning action condensed and arriving at the new position together. When Reacting to an unknown contact the base of fire team with identify and suppress the threat. The peeling team maneuvers position as a squad to a new advanced firing position to the left or right of the base of fire team. This is a vertical movement that is used to either progress or degress from any contact. The movement forward is a forward fire team bound to advance position under fire while maintaining fire superiority. The bounding movements should never be further then the base of fire team can provide. The rearward progression is technique to remove the team from a disadvantaged position with effective cover fire. Once movement order is established, one fire team will move together on line forward roughly 10/20m or 20-30ft. The other fire team will remain in position and provide security or cover fire. Once the fire team reaches position, everyone gets down in prone or behind cover and confirms they are “set”. The first fire team who was providing security can now bound forward past the set team or consolidate. This movement is used when the team is compromised by enemy fire (ambush). Rarely will you ever want to engage the enemy on their terms, there is a brief window of opportunity to gain the upper hand and regain control of the situation. The goal is to create a line of fire by shifting squad position. This movement pattern will give the ability to return fire and then make a decision to push or break the enemy contact. When taking contact from left or right, everyone will get prone and return fire. After creating sustained ROF, Team leader will make the call which fire team will be moving. Once the fire team is established they will either peel around the cover fire team or bound back and begin to break contact. At this point depending on the previous move the cover fire team must decide to peel around the other team or bound back and break contact. The team has the choice of continuing to peel and push the enemy or break contact and reengage on own terms. This movement is used when the team is compromised by enemy fire (ambush). Rarely will you ever want to engage the enemy on their terms, there is a brief window of opportunity to gain the upper hand and regain control of the situation. The plus of being hit from the sides is that the team will already have an established line of fire which will allow you to shift the odds rapidly. This movement pattern will give the ability to return fire and then make a decision to push or break the enemy contact. This is a great "battle buddy" drill to work on controlling pace and always maintaining aggressive base of fire. When taking ground, we always want to keep active fire, have an asset take a new position and take over the fire before the rear position is vacated. Using staggered targets zig zagging 25 feet in parrellel rows 50 feet apart. You can use barricade board as the simulated cover to bound or use the targets as positions that you are required to move to and get down to shoot from. "Contact (FRONT, 100 2)" - Buddy Team immediately returns fire and gets cover. "SET" - After gaining fire superiority, one stable positioned and actively firing player calls SET as he will hold position. "FORWARD READY TO MOVE" - Man who is moving first to the first target/barricade in the target ladder. "MOVING" - Man who is bounding forward is committing and making the move. Once the new position is taken, the forward buddy takes over the brunt of the fire and calls "SET!" The rear position buddy calls " MOVING" as he leapfrogs PAST his buddy to the next progression of target/barricade placement. The pair should now rhythmically take layers of ground with consistent hits on the presented targets. If the bounds take too long, you may be going too far. These should be short but quick movements with heavy fire, and second nature communication. Don't overthink the talking, the body language and confirming your responsibility will give your buddy confidence that you are doing your job. Move through the bound like someone is drying to draw a bead on you and shoot the targets with the same intent in acquisition and transition. When you clear the alley roaming block and scan the LOA line and high ready jog back to the start with your teammate. Repeat..